Nearly all graphite exploration companies are focusing on flake graphite and their concentration is on “large flake size”. There is, however, another potentially more lucrative, and definitely speedier path to market. 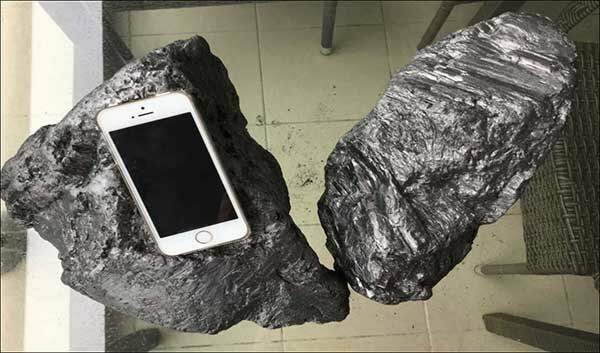 One ASX company has developed a neat way to commercialise high-grade vein graphite that will be more applicable in industrial manufacturing uses, than as a wonder material to be used in glitzy gadgets or electric cars. While some are off on a quest for market jam, this company has chosen to go for the bread and butter. This ASX company is aiming to develop an underground mining operation in Sri Lanka, to extract high grade, crystalline vein graphite, which is unique to the country. 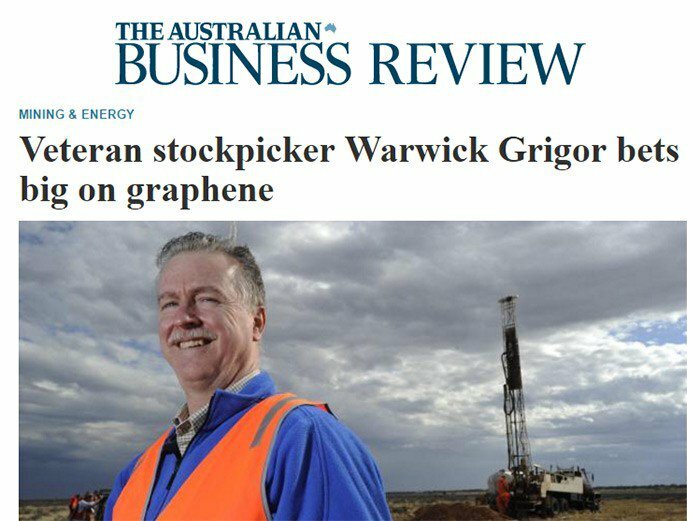 It then ships that graphite to Perth, where it transforms the material into graphene. While it continues to develop its 100% owned mines, its decided to accelerate graphene production, and has been able to source graphite from a third party producer. Interestingly it has just shipped its first 20 tonne container of high grade graphite from Sri Lanka to Perth via a third party. This is significant as it not only shows the company can move its product out of the region, but it will enable the company to more easily negotiate with buyers. The great news for shareholders is that this thread-through-needle explorer has earmarked commercial sales of both its high-grade natural graphite and its final derivative, graphene — as early as 2017. The date is speculative and should only be considered as one element in your investment decision in this company. If considering this company for your portfolio, seek professional financial advice. Just a smattering of graphene added to existing manufacturing processes can deliver significant improvements in build quality, durability and conductivity for many products including concrete, drilling fluids, lubricants, oils, tyres and even sensors that rely on high accuracy. Being the space-age material that it is, graphene can deliver sharp improvements in many industries and there are new applications being introduced on a regular basis. Now could be the time to find a graphite stallion with some strong heels, and harness it with a commercial saddle just in time for the uplift in graphene usage. ...but with this company’s unique angle of putting graphene on the store shelf, we think its vertically integrated graphene masterplan can kick-off early graphene sales in Australia and beyond. This graphite-graphene combo company has positioned itself to exploit the entire value chain from graphite all the way through to advanced compounds made from graphene. To do this successfully, this company plans to utilise efficient downstream processing to upgrade the commercial value of its ore. Importantly, the company is being aided by Adelaide University, whose collaborative test work chas confirmed the viability of the process. The Project this company is working on ticks all the right boxes in terms of geology, scale, management and commodity. This company’s overarching plan is to be the first company to market a 5 tonne per year graphene-producing appliance that allows anyone to JIT (just-in-time)-process this company’s graphitic ore into high-grade, high value graphene. While this company’s baseline is a profitable graphite mining operation, its upside and blue sky is the development of markets in the Graphene space with the advantage of the lowest cost, bulk scale quality Graphene. This company does not want to be limited to a mining company perspective. What it wants is to be seen as the intelligent graphite miner opening up new growth curves with advanced materials. This company has plotted a course to establish a profitable graphite mining operation as just a kick-starter to enable its overarching strategy: utilising first-mover advantage to develop one of the world’s only fully-integrated paddock-to-plate graphite miners with a graphene-tech trump card. 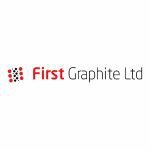 Dual listed First Graphite Ltd. (ASX:FGR; ETR:M11) is on course to become Australia’s first company to make it into commercial graphite and graphene production. And it is well on its way to fulfilling this ambition. Just this week, FGR delivered its first shipment of graphite to Perth , from material sourced from a third party producer in Sri Lanka. The premium quality graphite delivered will be used for conversion to graphene as well as in accelerating the establishment of FGR as credible supplier to the premium graphite market. Third party sourcing of the product will occur in tandem with the development of its 100% owned mines and as stated above will accelerate the establishment of FGR as a credible and reliable supplier of premium quality graphite to world markets, rather than waiting for sufficient stockpiles from its own mines. FGR’s own production is expected to commence this year from Sri Lanka — the world’s hotspot for natural vein graphite that regularly scores 95%+ in terms of Total Graphitic Carbon (TGC). So while the billion-tonne heavy hitters such as Syrah Resources (ASX:SYR) are going the tonka-truck route that includes lots of drill holes and years of exploration, FGR is aiming for a much neater route to the graphite market that doesn’t require a JORC Resource or several years of project development. It is about opening up mines and fast tracking the route to production rather than laboriously doing studies and making debt financiers comfortable. It all starts with Sri Lanka — possibly the purest source of graphite in the world. FGR first parachuted into Sri Lanka in April 2013 and quickly assembled a landholding spanning 395km 2 of exploration ground that has been left largely untouched for over 30 years. Sri Lanka was embroiled in a commercially repellent civil war between 1983 and 2009, but thanks to some peace-enforcement on behalf of the Sri Lankan government, in May 2009 the end of the 26-year civil war was officially declared. Sri Lanka has now left its gruesome past behind, and is looking for opportunities to harness its natural resource endowments, starting with graphite – in other words, Sri Lanka is well and truly open for business. FGR wants to be part of this phoenix-from-the-flames revival, and it’s been toiling in Sri Lanka since 2013 to make it happen. FGR’s exploration license areas are situated around the areas of Warakapola (Sabaragamuwa & Western province), Pujapitiya (Central province), Palinda Nuwara (Western province) and Hikkaduwa (Southern province). FGR also has a mining license at Aluketiya in the Western province. When it comes to graphite, Sri Lanka is a unique part of the world because of its vein structure, high grade and plentiful quantity scattered across southern Sri Lanka. There is plenty of exploration and mining tenure available, so it may just be a case of first come, first serve, which is where FGR could have real first mover advantage. As you can see in the chart above, in April, FGR’s share price rose from around $0.06 per share on the back of news that Sri Lanka had granted its first mining license in over 25 years . That’s a pretty big deal for a country so well endowed with high-grade graphite. What you see above is FGR’s Graphene Cell — a way for manufacturers to produce as much graphene as they require directly at their own premises at minimal capital cost. Not only is FGR facilitating a cost-effective way of introducing graphene into the manufacturing process, it is going one better and selling the raw graphite ore that will go into the Graphene Cell, with the pricing being based on the value added product that comes out the other end – graphene. Just one of FGR’s Graphene Cells can produce approximately 5 tonnes of graphene per year, and they’re expected to be snapped up by all sorts of manufacturing companies including from concrete, lubricants, oils and tyre manufacturers. FGR’s Graphene Cell is currently at the prototype stage and will go into mass production within months in parallel to exploration and mining activity ramping up to deliver the raw ore material. This technology is an early stage technology and anything can happen in its move from prototype to commercial reality. Investors should therefore take a cautious approach to their investment decision in this stock, taking into account all information with regard to the company. As is often common with new technology making its way to market, there is the quality and quantity gauntlet to run for FGR. The reason why we think FGR has a strong commercial chance is exactly because of this technology quality control at the University of Adelaide over the past 12 months. 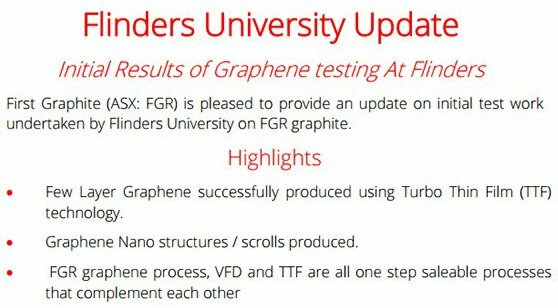 In May 2015 FGR received outstanding results from the Adelaide Research & Innovation Pty Ltd, the commercial development company of the University of Adelaide, on test work conducted on its Sri Lankan graphite and its properties for scalable graphene production. The lab testing showed that FGR’s graphite has “ very high crystalline carbon content not observed in any other previously tested graphite materials ”. One other key conclusion was that “ the quality of the prepared graphene from MRL’s graphite is outstanding and comparable with the quality of graphene prepared by synthetic routes ”. Further testing yielded TGC grades in excess of 90% which means there is a whole lot less processing required to reach the final high-grade graphite or graphene product. FGR’s graphite-to-graphene conversation efficiency rate is around 80% which will be honed and tweaked. FGR has initiated further test work with the University of Adelaide for 2016 aimed at producing commercial quantities of graphene. FGR’s collaboration with the University of Adelaide will be supplemented with work with other universities looking to conduct research into the commercial applications of graphene. In September of this year, the company signed a Memorandum of Understanding with Flinders Partners Pty Ltd , the technology transfer and communication company associated with Flinders University, for collaboration on the commercial development of Vortex Fluid Device (VFD) and Turbo Thin Film processing technology for graphite and graphene. 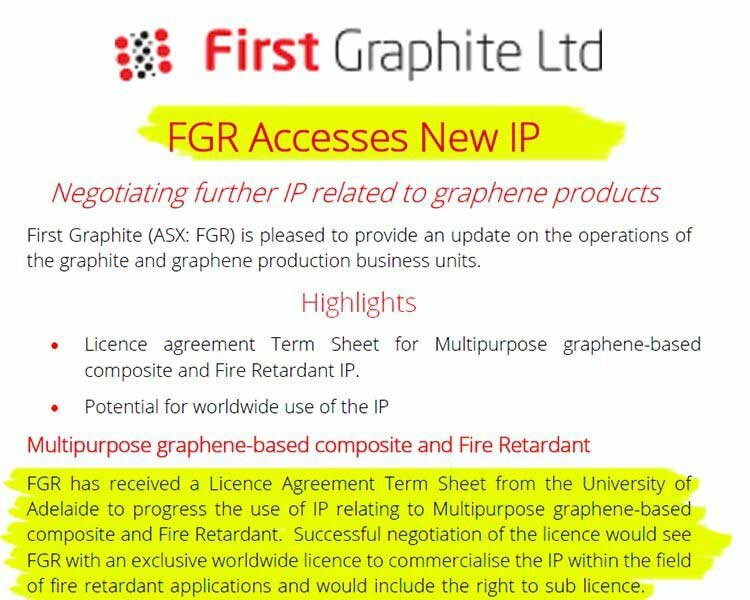 FGR has also entered into agreements with other industry partners which are aimed at outcomes for the commercialisation and sale of graphene to industry. For FGR, the carrot is that by conducting research in conjunction with established university laboratories, FGR could potentially secure lucrative intellectual property (IP) rights that utilise graphene. As you can see, graphene applications for electronics are being developed at breakneck speed, which is why FGR’s go-to-market strategy is so appealing. The other noteworthy point is just how many universities are getting in on the act. It’s not just private companies, but often publicly funded universities that are doing the cutting-edge research. We think that within a few years’ time, graphene will be a far more mainstream material than it is today and thereby will facilitate ample demand for FGR’s graphite ore and processed graphene made possible by the Graphene Cell. As the race to commercialise graphite and graphene continues in earnest, the commercial value of high grade graphite has remained very attractive to potential producers. 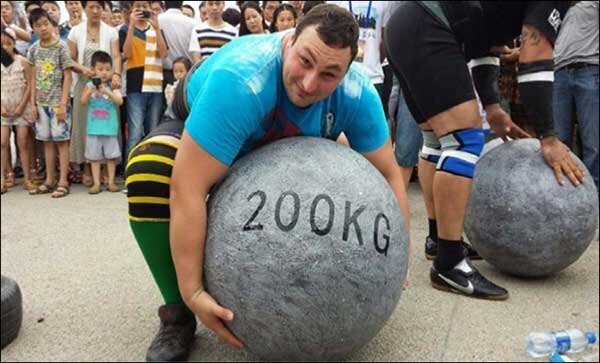 Lump and chip graphite from Sri Lanka has maintained a very healthy $1700 – $2000 price value range since 2010. Graphite demand is growing on the back of an increasing number of possible applications and rapid research and development being done on its derivative graphene. Many different industry niches including consumer electronics, green energy, medical devices, mining operations and military uses all have graphene technology on their wish lists. 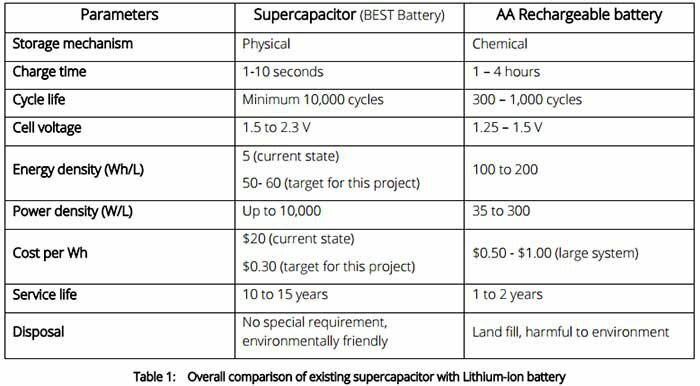 The US currently imports all of its graphite and companies like Tesla have shown that graphite offtake agreements may take on a rather inflationary tone over the coming years. 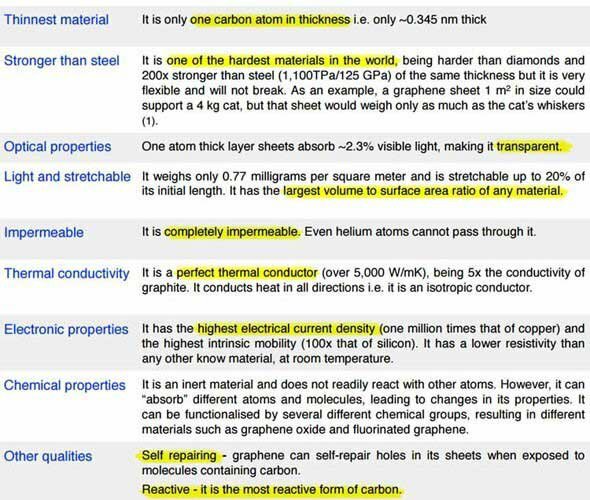 In fact, graphite has been classified as a “critically strategic material” by the EU, China and the US. Whenever the big hitters agree on something like that, it could mean graphite and graphene may well become homogenous commodities that underpin the production of everything in future. Chances are that a large proportion of the new technology now beginning to make it onto store shelves will be graphene-laden as standard in future. It is this rapid shift from traditional energy into new-age energy that FGR wants to leverage. And the high TGC graphite from Sri Lanka has all the hallmarks of being a very marketable product over the coming years. Which again brings us back to why FGR picked Sri Lanka as its graphite extraction site. Sri Lanka is the only area to produce vein graphite in commercial quantities. Sri Lanka had GDP growth of 5.8% in Q2 2015 and has averaged 6.5% growth from 2003- 2015. The Sri Lankan government is promoting foreign investment as a priority in order to kick-start much needed commodity for the country. There is excellent infrastructure and experienced mining labour available and FGR has options to expand its mining tenure if needed. Despite FGR’s small size, this little explorer is the largest holder of exploration licenses in Sri Lanka. FGR’s on-site exploration activity in Sri Lanka is building up speed, with ore delivery shaft expected imminently. Catching gloves at the ready eager-beaver catalyst catchers! In the meantime, the company isn’t waiting for first production – it has already received its first shipment of graphite from Sri Lanka to Perth from a third party producer, to convert to graphene. At the Aluketiya project, FGR embarked on Sri Lanka’s first ever downhole electromagnetic survey which delineated graphite veins and hopefully add more ore to FGR’s production schedule which will sidestep all JORC definitions and start to pick up steam from here on. The key milestone for FGR and for investors, is to demonstrate FGR’s ability to take a target area from exploration through to mining including obtaining a fully-fledged mining license in the process. The electromagnetic survey and the parallel commencing of production could bless FGR’s stocking with a juicy catalyst in time for Christmas. FGR has assembled a neat plan to market its proprietary Graphene Cell solution to companies that want to add just a little bit of graphene, for the biggest of effects. 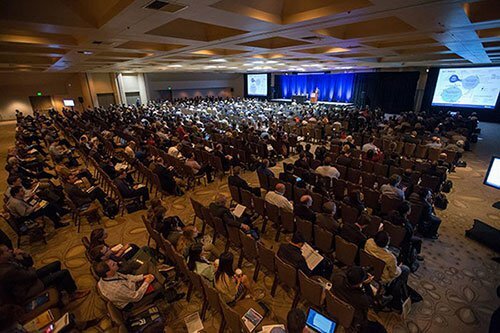 Graphene is provably marching towards playing a key part in the production process for many goods, especially electronics and new products tied into the energy storage revolution, which is being built on ample supplies of graphite/graphene, lithium and cobalt — the elements that make up the lithium-ion battery trifecta. But way before we get to futuristic Minority Report -style technology hitting the streets, industrial production of unsung items such as concrete, ink, oils and lubricants can already be sharply improved with graphene. FGR’s high grade graphite from Sri Lanka, combined with its Graphene Cell delivery method, opens an early door for investors to back the graphite demand uptick that is already occurring. This uptick could take on an entirely new dimension when graphene-assisted manufacturing goes mainstream. FGR is currently capped at $30MN — and with so many developments in the pipeline including production and the first taster of uptake of its prototype Graphene Cell, FGR could be a plucky developer well worth having on board if voyaging into the commercial wilderness of graphene stock selection. Investors should remember however that FGR is still an early stage player in the graphite/graphene game and as such caution should be exercised and professional financial advice sought if considering this stock for your portfolio. There’s nothing wrong with having a jam craving and mashing up some strawberries to make it happen — but there’s also much to be gained from the standard bread and butter-style strategy that has set FGR on a course towards graphite mining activity and graphene production later this year.